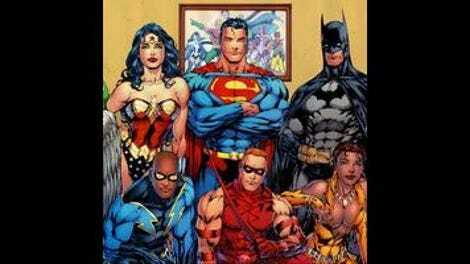 There aren’t many Justice League tearjerkers. Superhero-team stories tend to offer lots of punching and less in the way of emotional gravitas, but the second half of “The Terror Below” finds a way to combine the two for a poignant episode about faith and sacrifice. And it does all that in the context of a story that is essentially “What if Marvel’s The Defenders fought Cthulhu?” The Marvel Comics team was originally formed when Namor, Hulk, and Dr. Strange teamed up to take down the Lovecraftian Undying Ones, and Aquaman, Solomon Grundy, and Dr. Fate fill the roles of their Marvel counterparts in Justice League’s Defenders story. They’re joined by Hawkgirl, Wonder Woman, and Superman, who themselves can be seen as stand-ins for Defenders Nighthawk, Valkyrie, and Silver Surfer, as they try to stop a vengeful elder god from invading Earth with his legions of hellspawn. Just like “A Better World,” “The Terror Beyond” is an episode that feels influential to this series’ growth—not because of the way its plot develops, but in the wide use of the DCAU. The focus on characters like Dr. Fate and Solomon Grundy is a major shift for Justice League, showing that the creators are interested in using the showas a way to explore the many different facets of DC (and in this episode, Marvel) mythology. The episode begins with a familiar scene for Hulk fans as a mustachioed general and his fleet of tanks attack Solomon Grundy. He tears through them with the catchphrase “Grundy crush!” until he’s finally incapacitated by the military, then saved at the last minute by Aquaman doing his best Namor impression atop a giant purple sea serpent. Aquaman takes Grundy to Dr. Fate’s tower, where he’s going to be sacrificed to Icthultu, the “Old One.” Grundy’s an immortal being, so he’ll be back, and after the sacrifice is completed, Dr. Fate promises to restore the soul that was taken from Grundy decades ago. When the Justice League visits the site of Grundy’s attack, General Mustache leads them to Atlantis, where they’re greeted by a chilly Mera. When they’re attacked by one of the Old One’s monsters, Superman realizes a mystical connection because of his vulnerability to magic, which brings the trio to Dr. Fate’s tower. The League interrupts Fate’s ritual under the impression that Grundy is being tortured, setting off a hero vs. hero fight that takes up a large portion of the first half of the episode. Superman and Grundy have a face-off that ends with a piledriver from the sky that creates a mushroom cloud on impact, and Aquaman and Wonder Woman beat each other up with statues on Easter Island. Throughout this season, the directors have become better at capturing the scale of the action between these powerhouse characters, and Butch Lukic does fantastic work with this episode’s fight sequences. The League’s interruption of the ritual leaves everyone screwed when Icthultu appears, ready to send his horde through a dimensional portal. Dr. Fate and Hawkgirl are able to close the portal when they join together in the same incantation, which happens to be the closest thing Thanagarians have to a prayer, bringing up all sorts of faith-related issues within Hawkgirl. She’s already peeved that Wonder Woman is constantly exclaiming to the gods whenever she’s fighting, and when Shayera learns that all the Thanagarian legends about Icthultu are true, she’s filled with rage at what the god did to her people. I love when this show finds a way to fold relevant issues into the action, and Wonder Woman and Hawkgirl’s conversation about faith is a way for young viewers to decide how they want to view religion in their own lives. Does faith have to be grounded in theology like Wonder Woman, or can it simply be believing in the strength of your fellow man, as Hawkgirl learns this episode? The team decides to take the fight to the giant squid guy, although Aquaman peaces out to protect his people, which is a solid idea considering Atlantis is ground zero for Icthultu’s attack. The second half of this episode is a spotlight for Hawkgirl as she realizes Grundy’s sacrifice is just the latest in a line of offerings that included many of her Thanagarian ancestors, and her relationship with Grundy is the catalyst for the aforementioned tears. Icthultu immediately grabs Hawkgirl when he smells Thanagar on her, hog-tying her as the rest of the League faces down demons that are heavily inspired by classic Marvel monsters. As it turns out, Icthultu is rather petty for an all-powerful immortal being, and he’s annoyed that Thanagarians rejected him. When Solomon Grundy overhears Hawkgirl saying that the Old One takes souls, he goes into a berserker rage, leaping into the god and smashing it from the inside out. The usually villainous Solomon Grundy spent considerable time as a good guy in James Robinson’s Starman, and Dwayne McDuffie picks up on themes from that comic in his depiction of Grundy in this episode. Grundy isn’t inherently bad, he’s just angry, and that anger can be directed in certain directions. He wants his soul, he wants to live again rather than simply existing in his hard white shell covered in tattered rags. Grundy bashing at the brain of Icthultu leads to Hawkgirl’s escape, but at the cost of his life when one of the demons delivers a fatal wound. “Grundy can’t move. Birdnose get Grundy’s soul for him?” He asks, and Shayera obeys. Fueled by vengeance, Hawkgirl defeats Icthultu by hitting him really hard with her mace, the usual superhero way of solving problems. The rest of the League uses the ever-handy “put something in something else” method to close up the transdimensional portal, putting an end to Icthulu’s attack just as the emotional content comes in for a landing. 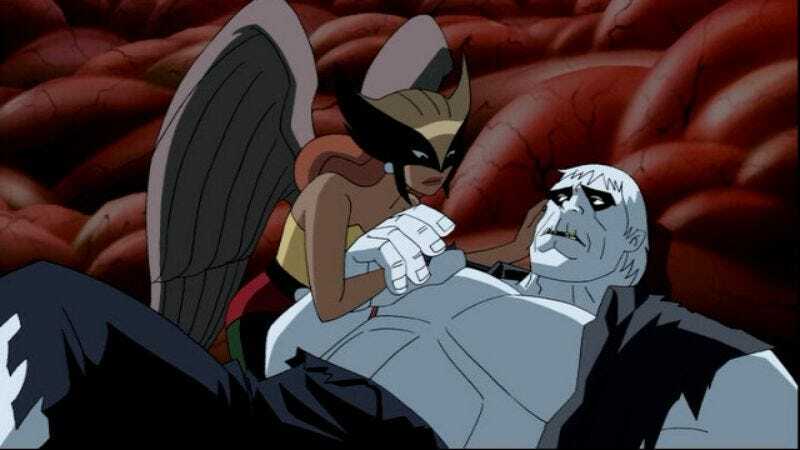 It’s amazing how much character growth happens for Solomon Grundy and Hawkgirl in this episode, foreshadowing the development of this world that occurred when McDuffie took a larger creative role in Justice League Unlimited. The ending of “The Terror Beyond” is absolutely devastating, which shows just how much emotional investment McDuffie is able to cultivate for Grundy in 40 minutes. After Icthultu’s defeat, Grundy asks Hawkgirl, “Do you think Grundy’s soul is waiting for him?” She begins, “Grundy, I don’t believe,” then stops. “Yes, it’s waiting for you,” she continues, and in that moment, it seems like Hawkgirl might actually believe it. “Then Grundy gets his reward,” he says before he dies, receiving a hero’s burial courtesy of the Justice League. At the funeral, Hawkgirl still doesn’t understand why Solomon Grundy was happy as he died, but Aquaman clarifies things for her: “It’s called faith, Hawkgirl. You’re not supposed to understand it, you just have it.” Inspiring words to conclude the episode as the camera zooms in on Grundy’s tombstone, the words “Born on a Monday” affectionately inscribed on the gray slate. In the Solomon Grundy flashback, we learn the someone can get shot up on a children’s show as long as it’s shown in shadow. In Fate’s tower, the League faces down gargoyles, which could be another Defenders reference as that team had a member by the name of Gargoyle. I always thought Aquaman and Wonder Woman were flirtatious in Superfriends, so it’s nice to see them pitted against each other in this episode. Three years before Pan’s Labyrinth, Justice League brings us monsters with eyes on their hands. “If you want to live, come with me.” Aquaman’s getting his Terminator quotes mixed up.